From David Langford, 94 London Road, Reading, Berks, RG1 5AU, UK. Web: news.ansible.uk. ISSN 0265-9816 (print); 1740-924X (e). Logo: Dan Steffan. Photograph of Peter Weston in 2005 supplied by Bill Burns. In memory of Peter, 1943-2017. I never said this to Peter – because he would have dismissed it as soppy – but I admired Peter as much as anyone else I ever knew. And I have met many people who were officially designated as admirable, people with knighthoods and OBEs and Medals of Honour, a Companion of Merit and even a member of the Privy Council. I thought more of Peter than of any of them, and for at least three reasons. Despite the bank manager, Peter went ahead and set up in a factory in Redditch. The only collateral he had was his house in Erdington, and he had a wife and a mortgage and three children. I wouldn't have had the nerve to do that. But he turned his little unit – 14 staff and a tea-boy – into a profitable business employing more than 100 people. What powered that success was not government assistance but reason number two, Peter's complete lack of pretence. The success of Weston Body Hardware was not based on cunning marketing or managerial tricks, it was based on Peter's 150-page catalogue of door locks, and unlike many managers Peter knew everything about his product. He took every picture in his catalogue himself, and in each one you could tell left-hand from right-hand. He usually had a screwdriver in his pocket as well, for removing interesting locks from derelict vehicles, and he could tell a Hillman Minx lock from a Ford Capri blindfolded. I recall one occasion in Texas, 1988, when his attention was caught by a beautifully-refurbished sports car in a car-park. He stepped smartly over to it, looked down, shook his head and remarked (to himself, not the yuppie owner who was standing proudly by), 'How very disappointing! An Austin-Healey 3000, and all they've found to put on the boot is a left-over lock from a Singer Vogue!' It sounded absolutely apocalyptic. Once his factory was established in Redditch – and for a time it was the only unit occupied in the business park, which tells you something about the recession – I saw him managing. He walked round the factory, he knew what every operator was doing, and he looked over their shoulders and said things like, 'you'll need a locking washer on that one.' He was not a desk manager. Which is why he never had any union trouble, unlike all those firms which made him redundant. His book about door locks is also an incidental indictment of British management culture back in the Heath / Wilson era. And the third, unrelated reason for my admiration was Peter's intellectual curiosity, which took him into science fiction. He wasn't led into this at school, he got no outside encouragement, and he sacrificed a lot out of pure devotion. His memoir With Stars in My Eyes – which was a Hugo nominee for Best Related Book in 2005 – details what he used to do: for more than a year he spent a quarter of his meagre salary on paying off a Roneo machine so he could produce his fanzines, and to begin with he didn't have an office or even a desk, he tapped everything out on a portable typewriter balanced on his knees. And those were the days when even spending $10 on paperbacks – if you had the equivalent of $10 – needed permission from the Ministry of Something-or-Other to buy an International Money Order. But what Peter produced, over a 40+ year span, is now recognized as a significant historical resource. Some of it's on line now, and I hope all of it will be. People will be writing PhDs about it, and they've already started! Not that Peter would have approved of that, but he would have been amused. Peter was also, of course, prominent in British sf fandom, and a leading light of the active Birmingham sf group. I'm not quite sure of the details, because although in the later 1960s Peter and I were actually living on opposite sides of the Birmingham to Worcester Canal, I don't know exactly when we first met each other. Local fans in the 1960s used to go round the bookshops and public libraries of Birmingham, leaving notes in sf books inviting people interested in sf to come to the next meeting of the fan group, and it may be I read one of those and turned up, meeting Peter there. What I do remember is the way Peter powered fan conventions: Eastercons, which were for the UK as a whole, but also the first Novacons, which always met in Birmingham. As a result, in 1979 he reached the very pinnacle of science fiction fandom. He organized the successful campaign to bring the World Convention to England, with the slogan 'Britain is fine in '79', and was made Chairman of the resultant Seacon in Brighton, which even suspicious Americans admitted was a great success for slick organization and imaginative programming. In 1973 he got a Best Fanzine Award for Speculation, though I'm not sure who from [this was the juried Nova Award presented at Novacon 3]. In 2008 he got a Fanzine Activity Achievement Award in Las Vegas, for Prolapse, and in 2015 a Lifetime Achievement Award from Tynecon III. He also edited the three Andromeda sf anthologies and got them published. And even after business started taking up much of Peter's time and energy, he continued to attend and support the Birmingham group, and remained well-known and well-liked in America. He was Fan Guest of Honour at Boskone in 2000, and at Noreascon 4 in 2004. The New England SF Association made him a lifetime member – and are printing a tribute to him in the Souvenir Book given to attenders at Boskone 2017. At one of the International Conferences for the Fantastic and the Arts in Florida, he attended and gave a paper about his favourite author, Jack Vance, which ought to have been published, only Peter reacted with horror at the thought of looking like – well, like a professor! NESFA also published Peter's fandom memoir, With Stars in My Eyes. Reading that memoir reminds me not just of the trials and tribulations of '50s and '60s Britain, but of the startlingly high quality of the fanzines Peter produced. He got letters of comment and reviews from, well, everyone, including the major authors. One final comment on sf is that Peter did not like most modern sf, but in his last few weeks I sent him a new book by Allen Steele, Arkwright, which he told me he enjoyed very much. The theme of it was, how much better things would have gone in space if they'd been run by sf fans, starting from a recorded meeting back in I think 1940. Well, that's right. And going further I often think – and I see I actually wrote this in the Guardian more than 20 years ago – that if the affairs of the nation as a whole had been entrusted to Peter, we'd all have been a great deal better off. He made his way without a springboard, and without assistance – except the very considerable one of his happy and settled domestic life, thanks to Eileen and the family of whom he was so proud. I always envied Peter his houses, his security, and his supportive family. 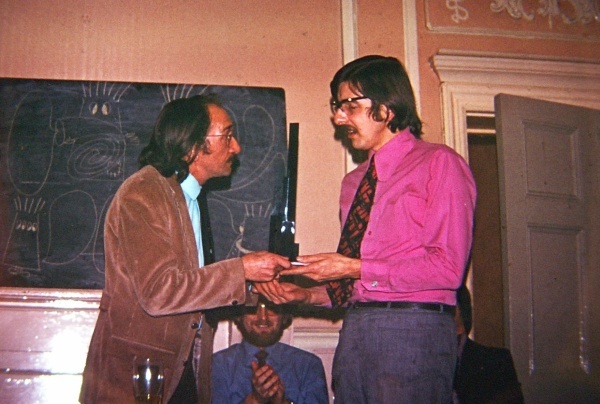 Ken Bulmer presents the Nova Award to Peter Weston at Novacon 3, November 1973. Ansible® 355½ © David Langford, 2017. The main text is a very slightly edited version of Tom's eulogy for Peter at the funeral on 23 January 2017. Published 1 February 2017.